just my little mess: is it fall yet? 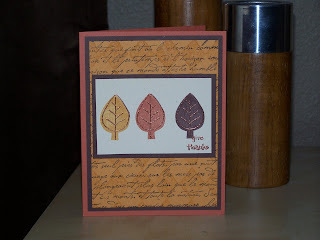 Even though it's 90 degress outside today I wanted to post a fall card. Isn't it cute? This is a card that I made about 2 years ago, it's still one of my favs. I'm so excited that it's fall...you wouldn't think so here in Texas. But we are suppose to get a cold front next weekend. Anyway...I got another lovely package from Mz. Bella herself over the weekend. I love the bella stamps - it takes forever to get them, but let me tell you it's worth the wait. Can't wait to get started on some more cards for my upcoming craft fairs.